This joyful fiddler will welcome all who enter with warmth and a lifted spirit. Crafted in cast bronze and includes the kosher prayer. 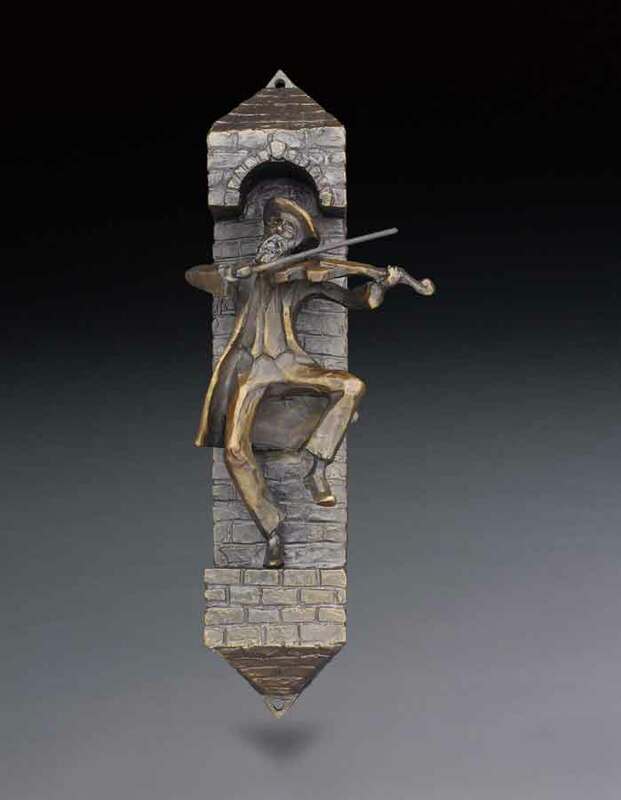 Replete with the joy of music and a warm welcome to all, this mezuzah is beautifully crafted in cast bronze and includes the kosher prayer. Dancing with the Torah raised high, this exuberant fellow will delight all who pass by with the warmest of welcomes. This joyful mezuzah is crafted in cast bronze and includes the kosher prayer. Crafted in cast bronze, this woman expresses her soaring spirit she feels when carrying the Torah. The exuberance for life and love of Torah is captured in this beautifully rendered mezuzah. Crafted in cast bronze and includes the kosher prayer. The lifting of the Torah mirrors the soaring emotion of the man carrying the scrolls of this beautiful Mezuzah. Crafted in cast bronze and includes the kosher prayer.